You can easily adjust the stacking order of layers simply by dragging and dropping them within the Layers palette. In addition, you can press CTRL-] (CMD-] on the Mac) to bring a layer forward (or higher) in the stacking order, or CTRL-[ (CMD-[ on the Mac) to send it backward. Add the SHIFT key to those combinations to send the layer to the very top or bottom of the stacking order. There are six groups of different blending modes, as shown in the following illustration, and in the Blending Modes section of the color insert. Table 6-2 gives a brief description of each blending mode. 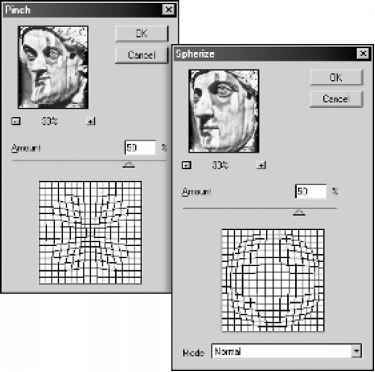 Scatters color throughout pixels Results appear "dithered" or "spotty"
For a visual representation of each blending mode, see the "Layer Blending Modes" section of the color insert. Because you can have so many layers in a layered Photoshop document, it's important to properly manage those layers. If left unmanaged, the Layers palette can quickly become an overwhelming mess. For example, suppose you created a file with many layers, none of which had custom names, such as the one shown in Figure 6-2. While the thumbnail images on each layer can provide a bit of help, it's difficult to determine exactly what's on most layers. And what if you close the file and then need to edit it two weeks later? You'd need to click through each of the layers just to remind yourself of their contents. Figure 6-2 Files with unnamed layers, such as this one, are difficult to manage. Tips in the following section explain how to perform each of these tasks, as well as other ways to use layers in Photoshop.